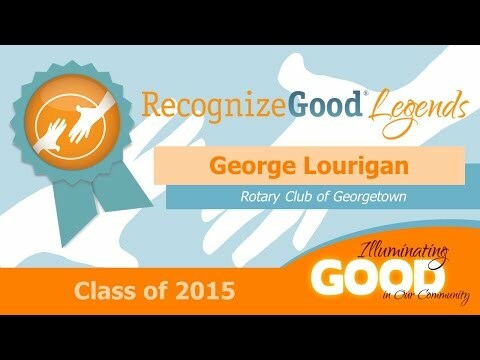 After decades of service spanning the military, missionary work in Guatemala and Central Texas groups like Meals on Wheels, Heroes Night Out and Rotary Club of Georgetown, students at Georgetown ISD couldn’t ask for a better mentor than George Lourigan. When we seek out a mentor, what do we look for? We look for wisdom, certainly, gained from life experiences that shape the type of person we might one day hope to become. We look for generosity, both of spirit and of deed. We also, of course, look for success – defined in many ways, but always centered around the achievement of personal goals. For Georgetown ISD students, the wisdom gained from George Lourigan’s years of dedicated service – spanning not only decades, but continents – is making an extraordinary difference in their lives. A retired 30-year lieutenant colonel in the United States Army, George has devoted his life to helping others. The list of his volunteer service is seemingly endless – an active Rotarian overseeing and working on multiple Rotary projects both locally and internationally, George volunteers his time as team leader each month to build wheelchair ramps at the homes of Central Texas residents. He has volunteered time with Meals on Wheels for more than 7 years, and serves as Vice President of Bridge Ministries, where among other things George collects old computers and fixes them up for formerly homeless people as they attempt to reconnect with society. George also impacts lives abroad through his missionary work, helping build schools and village communities in Guatemala for the past several years. He also dedicates half a day each week to help improve the lives of fellow veterans through Heroes Night Out, and stays incredibly active in his church, chairing extremely large church festivals with up to 6,000 attendees and teaching woodworking to youth to the tune of over 200 completed wood projects each year. Laura continues, “George has a servant’s heart – the unsung hero, the friend that will give you the shirt off their back to help you in your time of need, quietly going about service to others, telling no one and asking nothing in return.” These lives led by example are undoubtedly exceptional, and are looked up to not only by students, but by all of us.